Ah yes, rapper Blu is back in the new visual for "Ease Your Mind" off the 2012 tag team album with producer Exile called Give Me My Flowers While I Can Still Smell Them. 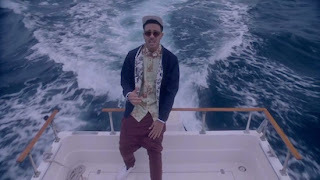 The visual follows Blu kickin' those rhymes on a boat at sea, just chilling. I've been happy with Blu's productivity because his potential for the last few years has been crazy, I think he is getting a steady work flow building and hope more hip hop heads get with this Cali rapper. Watch below.